Planning meals that are healthy and delicious can be challenging but look no further than recipes for Swiss chard and leeks for easy options. These versatile vegetables can either enhance other ingredients or take center stage in casseroles, soups and other types of cuisine. 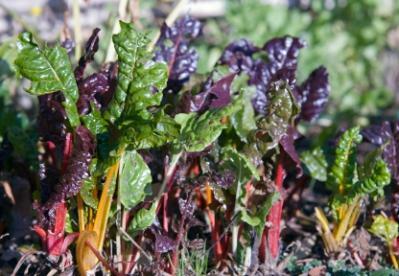 Swiss chard is a type of beet that is cultivated for its stalks and leaves rather than its root. Use it in recipes interchangeably with beet greens for lovely results. This vegetable is high in anti-oxidants, fiber, vitamins A and C, iron and potassium and is easy to grow even for an amateur gardener. The culinary rule when handling Swiss chard is to prepare the stalks similar to asparagus and treat the leaves like spinach. The taste of chard is more full-bodied than spinach and its texture is more robust, so keep that difference in mind when trying it in a recipe. Use Swiss chard in stuffing, soups or stews. Boil, steam, braise, sauté, or prepare it raw and it combines very effectively with other compatible vegetables such as leeks. Combine all the chopped vegetables in an attractive manner and spread on platter or individual plates. Either serve immediately or allow to mellow overnight to enhance the flavor of the dish. The leek is a gorgeous Allium, similar to scallions in appearance with lovely green and white coloring but a mellower taste. People often avoid cooking with leeks because of the difficult to remove sand and grit found throughout its many layers. However, with judicious washing this root vegetable is a great addition to any recipe that has onion in the ingredients. Leeks are rich in potassium as well as many other minerals and vitamins crucial to good health and can be eaten everyday in a variety of delicious dishes. In a large skillet cook the bacon until it is crisp. Using a slotted spoon, remove the bacon to paper towels to drain. Cook the leek in the fat remaining in the pan, over medium low heat until soft, about ten minutes. Stir in the tomato, tarragon, the half-and-half, the broth. Bring the liquid to a simmer and cook over moderate heat, stirring, until thickened. Stir in the bacon and season. These two vegetables marry well together in taste and texture to create wonderful dishes that are equally perfect for a comforting family meal or an elegant dinner party. Creating unique recipes for Swiss chard and leeks is not difficult and can be extremely satisfying when tasting the results. In a large heavy stockpot, cook the leeks in the butter and oil on low heat until translucent and slightly caramelized. Add the Swiss chard and chicken stock. Increase heat to bring to a simmer. Reduce heat and simmer until the chard wilts, about eight minutes. Add the rice, salt, and pepper. Cover and simmer over low heat until the rice is cooked, about 20 minutes.